“Whether you’re a seasoned polymer clay artist looking for fresh ideas or a beginner looking for a new craft, this book’s for you. Inside you’ll find 21 easy-to-follow, step-by-step projects designed to push your creativity to new levels. Lisa Pavelka shows you how to put an exciting, new twist on polymer clay techniques by incorporating beads, foil, rubber stamping and wire to create unique decorative effects. You’ll create jewelry, picture frames, greeting cards, garden accessories and more. Important guidelines for buying and working with related tools, plus tips for baking your polymer clay safely help you get started with skill and confidence. This is one of 4 of Lisa Pavelka’s books she’s published on polymer clay. “Polymer Clay Extravaganza” is just what is says it is, an extravaganza of projects for a multitude of areas. Like Lisa’s other books, she does a great job covering polymer clay basics and all the things a brand new artist to polymer clay needs to get started. The formatter covers just the 4 name brands of clay: Fimo Soft, Fimo Classic, Premo!, & Cernit. The formatter covers topics of choosing clay, conditioning, leaching, measuring, baking, blending, storage, work surfaces, and a large section on tools. She also covers a few surface treatment options like mica powders, paint, stamps, leaf, & foil. She also covers a few sealants: glaze, wax, liquid clay, superglue, & epoxy. Lisa also discusses briefly finishing pieces and a few basic techniques. The book then opens into the polymer clay projects featured in the book: 3 projects on paper crafting & polymer, 5 memory craft & polymer, 4 desk accessories & polymer, 3 polymer jewelry projects, 3 home decor projects with polymer, and the final section features 3 projects on garden decor. All of the project in this book can be completed by beginners to intermediate artists. Many of the projects are simple in form & structure, perfect for classroom projects. My favorite projects in this book include: flower pen stand (pg. 66), spirit song amulet (pg. 82), & garden stakes (pg. 106). Simple tweaks & additions can take each of these projects from the “beginner” arena into the advanced arena. 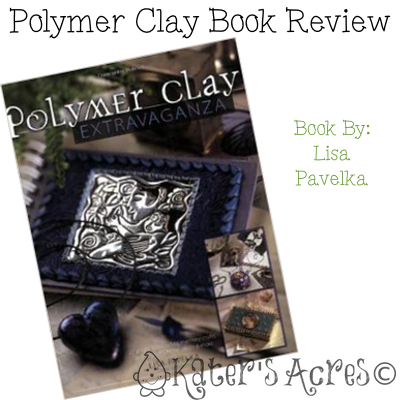 Overall impression: This is a great book for you to keep in your polymer clay library! Click here to buy it now. The projects provide a wide range of instruction for many different areas of use within your home. At minimum it offers an extraordinary color palette, idea generators, & inspiration with every page turn. Many of these projects would make extraordinary gifts to give to family & to friends. This being said, if you’re searching for some new projects, this is a great jump start to your creative process that will help you think outside the box and create something special & unique.